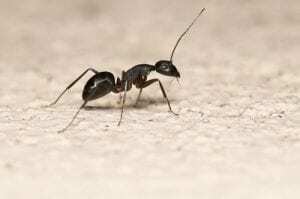 While many ants species that find their way indoors are considered nothing more than a nuisance pest, there is one species that can cause extensive damage to both homes and businesses. Carpenter ants are responsible for extensive property damage as they hollow out wood to build their nests. If you are experiencing any of these problems around your home, it’s possible you already have a carpenter ant problem. Unlike termites, carpenter ants do not eat the wood that they excavate around your home. As they are creating galleries for their nests, they will typically push out sawdust-like materials that accumulate into piles. In most cases, these will be found in high moisture areas such as crawlspaces and other dark areas that are undisturbed around the home. If you have found unexplained sawdust piles around your home, it’s typically a good idea to start surveying that area for potential wood damage. As they begin to tunnel into wood, it will create a small rectangular window which will lead deeper into the wood. This is a sign that your carpenter ant problem has progressed and will likely require professional ant control to remedy. Carpenter ants are much larger than most other ant species that can be found in man-made structures and are often just seen as a big, black ant. However, like other ant species, they will typically be found searching for food sources since they don’t eat the wood that they tunnel through. Through the spring, you may also find winged carpenter ants looking for new nesting sites. Why Pied Piper Services for Ant Control? 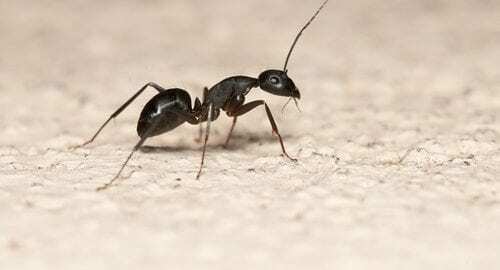 Once ants have established a colony in your home or business, they can be incredibly difficult to get rid of without the assistance of a pest control professional as DIY treatments only treat the visible populations. 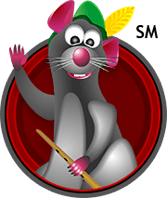 The experts at The Pied Piper have the knowledge, skills and equipment needed to ensure your ant problem doesn’t continue. If you need help removing ants, contact us today!